ICE Detains Mexican Man Who Sought Sanctuary in Denver Church for Nine Months | Democracy Now! interfaith organizer for American Friends Service Committee in Denver and coordinator for the Metro Denver Sanctuary Coalition. A Mexican immigrant named Arturo Hernández García was arrested Wednesday morning by U.S. Immigration and Customs Enforcement. 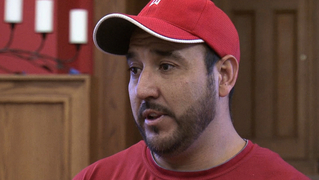 Hernández García had sought sanctuary from deportation at the First Unitarian Society church for nine months until July 2015, when he was told he was no longer a priority for deportation. Supporters of Hernández García say he has been targeted in part because of his immigration activism. We re-air our interview from Hernández García in 2015 and speak to Jennifer Piper, interfaith organizer for American Friends Service Committee in Denver and coordinator for the Metro Denver Sanctuary Coalition. AMY GOODMAN: We go now to Denver, Colorado, where Mexican immigrant Arturo Hernández was arrested Wednesday morning by U.S. Immigration and Customs Enforcement. Hernández García had sought sanctuary from deportation at the First Unitarian Society church for nine months, until July 2015, when he was handed a letter and told he was no longer a priority for deportation. In a statement now, ICE spokesman Carl Rusnok said, quote, “Hernández García has overstayed his original, six-month visa by nearly 14 years. He has exhausted his petitions through the immigration courts and through ICE.” Well, supporters of Hernández García say he’s been targeted in part because of his immigration activism. A group of about two dozen people outside an ICE office in Centennial on Wednesday afternoon to protest his arrest. Meanwhile, last week, an immigrants’ rights activist who sought refuge in the same Denver church was named one of Time magazine’s 100 most influential people for 2017. Jeanette Vizguerra came to the U.S. from Mexico in 1997, one of the founders of the Metro Denver Sanctuary Coalition, who has helped undocumented immigrants seek sanctuary. Earlier this year, she skipped a scheduled check-in with ICE officials and instead sought refuge in the First Unitarian Society church. And she has four children. Three of Vizguerra’s children are U.S.-born. She made the decision to seek refuge in the church out of fear she’d be deported under the Trump administration. So, she couldn’t go to the big Time gala for the 100 most influential people, but they had a gala at the church. She couldn’t step outside, afraid of being arrested by ICE Tuesday night. It was Wednesday morning that the man who took refuge at that same church just two years ago was taken by ICE agents. To talk more about the situation of undocumented immigrants under the Trump administration, we go to Denver to speak with Jennifer Piper, an interfaith organizer with American Friends Service Committee Denver. She coordinates the Metro Denver Sanctuary Coalition along with Jeanette Vizguerra. Thank you so much, Jen, for joining us. Can you explain what happened to Arturo? We visited him when he took refuge in the church. Explain what’s happened now. Why was he taken off the street? JENNIFER PIPER: Good morning. Absolutely nothing has changed in Arturo’s case. He’s been in the U.S. for more than 17 years. He has two kids. He has a 17-year-old and an 11-year-old daughter. He still has no criminal record. He is still a father. He’s still a small business owner. And he went to work. When he went to the company warehouse to pick up tile, as he was leaving, Immigration and Customs Enforcement was waiting for him, detained him, took him to the ICE office in Centennial, where we tried to block his exit for several hours. But we believe he is now likely in the GEO for-profit detention center in Aurora. AMY GOODMAN: Now, explain. What did ICE tell you? Did you call them? Was he actually given a letter by the Department of Homeland Security back in 2015, when he decided to leave the church and dare to step outside again? AMY GOODMAN: —about why they picked him up yesterday? JENNIFER PIPER: So, Arturo does have a final order of deportation. That’s why he entered the congregation in October of 2014. Everyone who enters sanctuary has a final order of deportation. And in his case, we felt that they had not used their discretion. And so, when I spoke with Immigration and Customs Enforcement, they said he had a final order and that there are no longer any priorities under the Trump administration for enforcement. And when you look at Trump’s executive orders, that’s true. Every person who’s removable from the U.S. is a priority for his administration, regardless of their criminal history or not, regardless of how long they’ve been in the U.S., regardless of their ties to this country. AMY GOODMAN: I want to go back to 2015, when I went to the First Unitarian Society church in Denver to meet Arturo Hernández García. ARTURO HERNÁNDEZ GARCÍA: I am a good person. I am working hard here by 16 years in Colorado. I never be in trouble. I never be arrested. I never stay in jail before, here or in Mexico. ARTURO HERNÁNDEZ GARCÍA: I have one daughter that is 15 years old. She was born in Mexico. And she’s in DACA. It’s the deferred action for students. She’s now get a—permits job for her. And I have Andrea, is 9 years old. She’s a citizen. ARTURO HERNÁNDEZ GARCÍA: We come here, United States, to work and the future for the family. We are not criminal. It’s not true what the people, the government say on TV. So, I come here to, yeah, like I say, just to work and a better future for my kids. And I’m contributing for the stay. We work and pay taxes. And so, everything I do, I do for my family. AMY GOODMAN: So, Jennnifer Piper, that is Arturo Hernández García two years ago, when I saw him in the church, before he decided to leave, with his paper from the U.S. government saying he was not a priority for deportation. What will happen now? Several dozen of you gathered in Centennial, a suburb of Denver, to demand his release. What is the process now? We have 20 seconds. JENNIFER PIPER: Yeah, we’ll continue to fight for his release, and we’ll continue to push back on President Trump’s policies. We know that the courts have just found again that his immigration policies are unjust. And we call on people to visit their congressperson today and to push back on the immoral budget that is being proposed tomorrow, to say no to $4.5 billion more for border and interior enforcement. Congress is responsible for this mess. Congress needs to stand up, including Democrats, and say this budget is cruel and it’s immoral. And we need to visit our congresspeople’s offices today, because the vote is tomorrow. AMY GOODMAN: Jennifer Piper, thanks so much for being with us, with—the interfaith organizer with American Friends Service Committee. That does it for our broadcast. We continue our multi-city tour. Today at noon, I’ll be speaking at Bennington College, and then tonight at Unitarian church on Pearl Street in Burlington, Vermont. On Saturday, Democracy Now! will broadcast for five hours from the People’s Climate March in Washington, D.C., from 10:00 to 3:00 p.m. Eastern time. Saturday night, I’ll be speaking at Plymouth Congregational United Church of Christ and on Sunday at Busboys & Poets at 5:00. Then it’s on to Durham, North Carolina, Miami Tuesday, Tampa Wednesday, Atlanta Thursday, Minneapolis and Carlton, Minnesota on Friday. Check our website for details.